A pair of young sea eagles appear to be setting up home in Orkney. The two birds, which have been regular visitors to the island of Hoy over the past two years, have now built an eyrie among crags on the island. It is not clear where the pair have come from, but it is possible they may have travelled across the North Sea from Scandinavia. The RSPB said there was a strong possibility the nesting attempt would fail, but it was not inevitable. East of Scotland sea eagle project officer Rhian Evans said: "They don't start breeding until they're five years old generally. This pair we think are around four years old. "They are young, but also they are capable, and we have had young birds breeding successfully." Sea eagles are the UK's largest birds of prey - with a wingspan of almost two-and-a-half metres. The last bird in Britain is thought to have been shot and killed in Shetland about 100 years ago. A process of reintroduction began in the late 1960s - initially on the west coast and islands, and more recently on Scotland's east coast. The RSPB says the nesting attempt in Orkney could mark a significant milestone in the expansion of Scotland's sea eagle population. The eagles are thought to have been a symbolic creature for Orkney's neolithic community. Bones of the birds have been discovered in burial cairns in the islands, most notably at the Tomb of the Eagles in South Ronaldsay. Some local farmers have expressed concerns about the return of sea eagles to the islands. They fear that they could predate on livestock - particularly young lambs. Scottish Natural Heritage (SNH) last week announced the launch of a new scheme to monitor the impact of the birds on farmers and crofters. 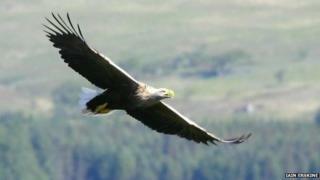 The scheme will operate from 2015 to 2018 and will investigate all issues involving the raptors' impacts on livestock. SNH says it will also see the trial of prevention measures where required and considered practical.